This is your chance to compare the disclosure with the estimate you previously receive and to query any discrepancies. There shouldn’t be any such discrepancies that can’t be justified transparently. Indeed, this is your last chance to challenge any errors without derailing your home purchase, so review the document carefully. At least three business days before you’re due to close, you should receive a closing disclosure. Could there be a worse time? You’re preparing to move! And your to-do list has never been longer. So the last thing you want is a five-page document to wade through. Resist the temptation to ignore it because this is your last chance to make sure the mortgage deal you’re getting is the one you’re expecting. And possibly your last chance to fix any errors and close on time. You’re going to get a mortgage disclosure. Your lender is legally obliged to send you one at least three business days before you’re due to close. You’ll have received some of this information before in a Loan Estimate. But, as the name implies, those were just estimates. The mortgage disclosure document shows finalized figures. This is your chance to compare the disclosure with the estimate and to query any discrepancies. There shouldn’t be any such discrepancies that can’t be justified transparently. Indeed, this is your last chance to challenge any errors without derailing your home purchase. Okay, you can simply refuse to sign on closing if you notice an error then. You’ll be delaying (if not aborting) your purchase — possibly by weeks. Identifying issues earlier, when you get your closing disclosure, can often see you avoid delays altogether. Even if you hate forms and legal documents, the closing disclosure is easy. It is a clear, simple, standardized form used by all lenders. And, thanks to its uncluttered layout, it gives you the maximum information with the minimum fuss. Most home buyers will be able to zoom through it in minutes rather than hours. Federal regulator the Consumer Financial Protection Bureau (CFPB) has come up with a sample form. That has annotations that explain the most important things you can check. 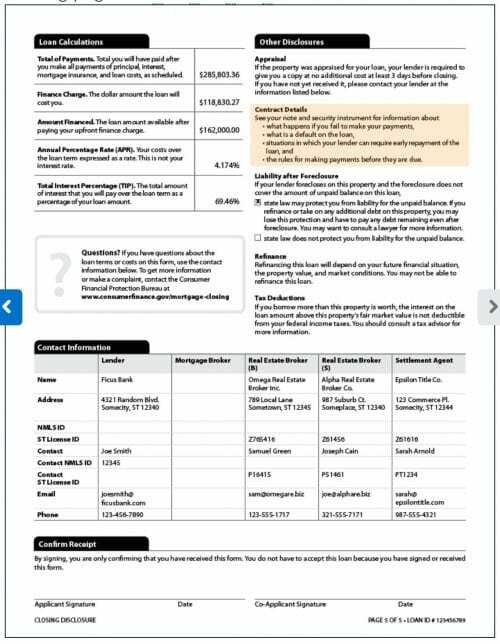 The Mortgage Reports is sharing that sample below, courtesy of the CFPB. 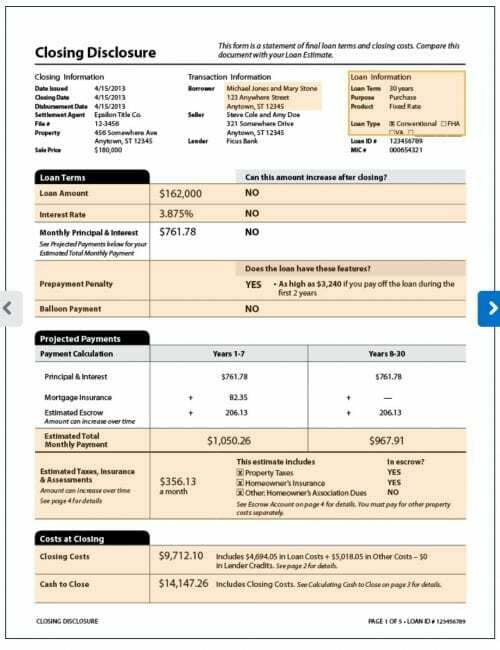 The second page breaks down closing costs. It also makes clear whether you’re buying a cheaper interest rate by paying more on closing (“points”). There are two main categories of costs: services you didn’t shop for (appraisal fee, credit report etc.) and those you did shop for (maybe a pest inspection, survey or title insurance). For the former, compare the costs on the closing disclosure with those on your loan estimate. For the ones you did shop for, make sure the sums match the amounts you agreed to pay. 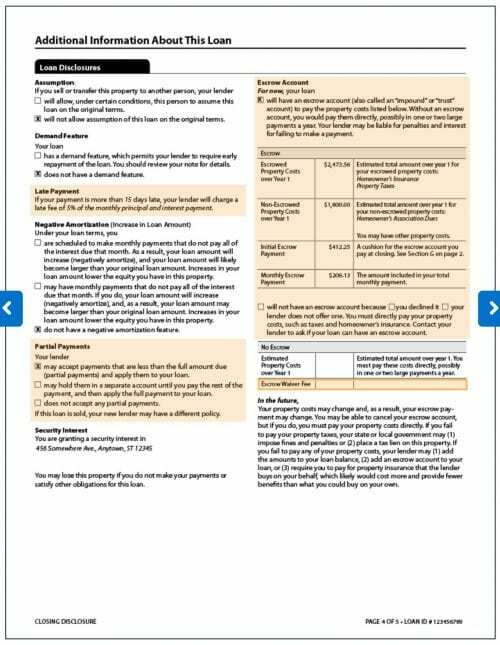 This third page itemizes the sums that make up your “cash to close,” the amount you’re going to pay on closing. It also breaks down the smaller transactions (things like local property taxes and homeowners’ association fees) that are necessary to complete your purchase. If you’ve agreed to a “seller credit” (a contribution toward your closing costs that the seller agrees to make) with your vendor, make sure the amount at item L-05 matches your agreement. 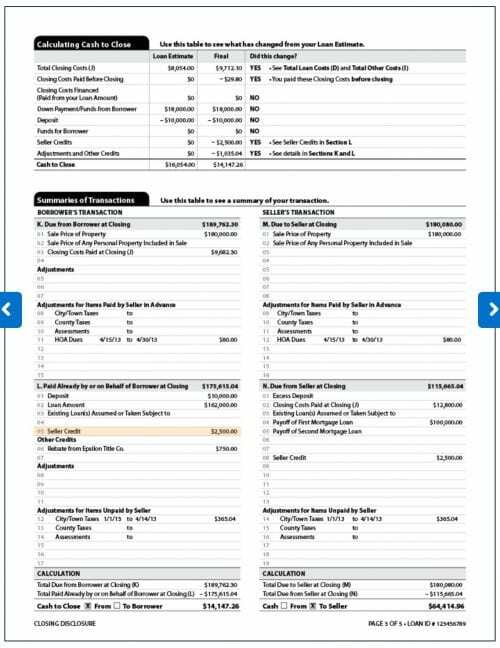 Page 4 lays out more numbers and details concerning your escrow account. That includes whether you have one at all. If you don’t have one, you may (or may not) be paying an escrow-waiver fee. 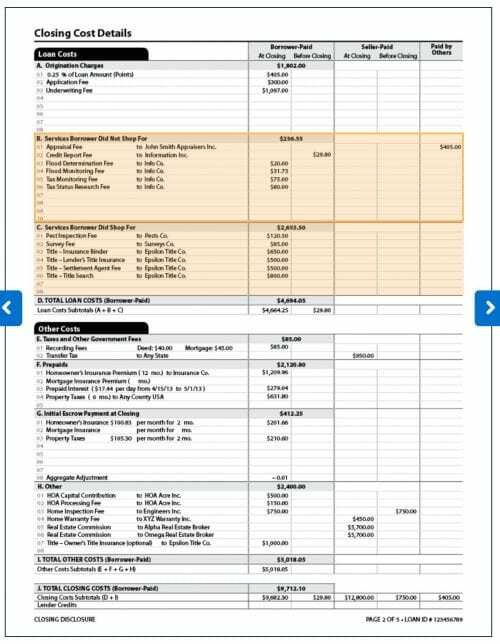 The cost of that will be indicated toward the bottom of the right-hand column. The last page follows up on the bad stuff. So it reminds you to read your note (mortgage agreement) to know what happens when things go wrong, including what it takes to trigger a default and the circumstances under which your lender can demand early repayment. It gives you the big numbers: the total amount you’ll pay over the lifetime of the loan, together with how much of that is in interest. You’ll also find contact details for all the professionals who’ve worked on your mortgage and purchase. Finally, page 5 requires your signature to acknowledge receipt of the closing disclosure. Don’t worry. Your signature doesn’t mean you agree to the document’s contents. It just shows you’ve received your copy. The whole point of the closing disclosure is to give you a chance to get errors and issues corrected before it’s too late. You only have as little as three days to do so. Please read the document and act on corrections as soon as possible. Chances are, your best course of action is to call the lender or mortgage broker. Your real estate broker or attorney (if you have one) may take up the issue on your behalf also. Remember, your contacts’ names, phone numbers and emails are on page 5. Explain your issue and ask your contact to act on it. Agree to a time by which you’ll get a response. But you have to be fair. It may take some time to sort out something complicated. On the other hand, you’re up against the clock. So “I’ll do my best to fix it before closing” just won’t cut it. Maybe your issue’s small (the pest inspector’s overcharged you $20) or maybe it’s big (your interest rate increased for no reason). But, if it’s big enough to bother you, follow through. Following through includes immediately writing an email to your contact, saying, “Thanks for your help on the phone just now. We agreed …” Then lay out the contents of the call. Be sure to spell out what triggered your call, the action agreed and the deadline for a response. Copy the email to others who may be interested, such as your real estate broker and attorney. There’s a good chance that, by acting early and decisively, you’ll clear the path to a smooth closing. If you’re unsure what happens at closing, read “Mortgage Closing: What Happens At Your Signing.” If you still have any queries, use The Mortgage Report’s Ask an Expert online service. Just post a question and wait for a response from a professional.